The day had finally arrived, but not without fury. The paper had done a great story. I was mentally prepared for the highs and lows the day would bring. 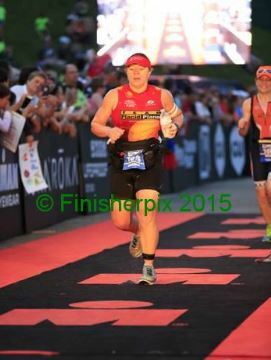 I had been thinking about how thankful I was to be able to try an Ironman. I hadn’t stressed about the weather or such, really no need. Couldn’t change it and I’d raced enough to know how to handle various conditions. My first nerves kicked in during bike drop-off I almost hurled. A lady said ‘It’s your first…here’. My sugars skyrocked so I adjusted my insulin for the next 24 hours accordingly. It was good to get OUT of Lake Placid that day. At around 7pm; when I was heading to bed there were a ton of sirens. A quick peek at Facebook and it looked like buildings in Lake Placid were on fire. While I felt awful for the people, it didn’t even cross my mind that this was an issue for the race; even with the building being on the lake. I wish I had known it was foreshadowing for temperatures the next day! The morning of went smoothly. Kevin and I got a great parking spot. Even leaving later than we wanted we were set up and out of transition in plenty of time to relax for a bit at the pub. My blood sugar was good during most of the evening; a bit low at breakfast but the pancakes brought it right back to 154 when we left my monitor on my bike. When Tim came I was up to 223, perfect for the start of the event. I took a gel, had some water and we were off. While lined up I realized that not everyone had a clue about how fast they swam. When I asked people around me their pace they said “1:20 to 1:30” but had no idea their 100 pace or a narrower scope of their overall. I kept creeping up, contributing that to inexperience. I founds other diabetic I had heard about from my diabetic friend Kaileigh, whose name still eludes me, #986. She was carrying her pump. I introduced myself and began to relax in conversation. The Swim, no lie, was probably my favorite part of the day. And that is saying a lot given my swimming. 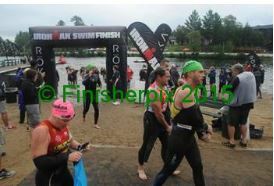 I felt good and my first lap I swam really well for me. I got bumped around a bit but not too much. The turn at the far end was rough so I just held steady. I found some feet at the end and calmly swam back. I cut the bouys a bit tight and got smushed, resorting to a few breast strokes as I approached the beach. Up and out in 43 min–great for me! Tim helped me test and bammm, I was 145. Perfect!! Excited I ate one + a half gels and got back in. I really felt like I swam the second loop so much better. I was closer to the line, it wasn’t as rough. The far end turn was much easier. I was passing more than people were passing me. I pushed hard at the end to get out in 44 minutes. Still really great for me and close to my first lap. Testing took a bit longer this time but I was on my way quickly at 185. Awesome!mi felt good having swum over 2.5 miles. Transition 1, wow, I was told the tent was going to be crazy but nothing could have prepared me for several hundred people all doing what I was doing. Thankfully I was organized, quickly grabbed my stuff. As I was ready to leave there was a girl I asked to pack my bag. I got some lotion. Grabbing my bike was easy, my cgm was already reading and I was off. The Bike, sad but true it is the first part of this ride that screwed me up for the rest of the day. On the way out of town I was working to fuel and hydrate. I felt great. I ended up drinking my entire speedfil (40 oz) prior to the first aid station (which is 6 miles out of town). I filled it and continued on. I passed several people while keeping my bike in a gear easier than I could ride still feeling great! I took in gel where I had practiced and decent was a piece of cake with no traffic. I ended up getting stuck on the last mile of the decent behind the motor bike, slowing me and about 50 others down. We all chuckled shaking our heads. I continued monitoring sugar, riding a bit easier, fueling and hydrating. I stopped at each station to replenish. Out and back to Ausable I ate another gel and took some insulin to stabilize my blood sugar. I filled up at the next three aid stations and found myself climbing out of Wilmington in good shape. I was slower than I had wanted but my normalized power was 158, my plan was going well. First loop done…yeah! I felt like a rocket on the second loop, especially going out. 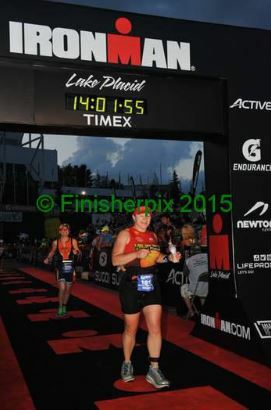 I tried to hold back a hair knowing the tough part of the course was at the end. I passed Kevin on the Keene corner saying “I love you!”. My blood levels were great, I was hydrating a lot, my legs were solid. 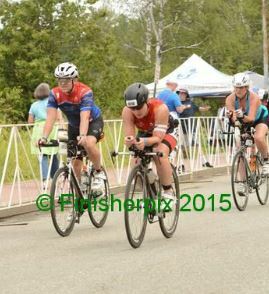 I was pushing but not too hard; I was hot but not cracking like all those around me. My power was higher with np ~165 hitting highs of 225. Coming back in from Ausable I realized I hadn’t peed, so I began to drink more and more and more. My legs got twitchy so I took some anti-cramp things and made it a point to hydrate well. I road hard and steady. Mentally I felt great and physically I was holding up. I felt like the second loop was going much better than the first. Transition 2 was much calmer. My helper was awesome placing my visor on my head while I was changing shorts. I grabbed my water bottled and she opened my gingerale that I chugged. 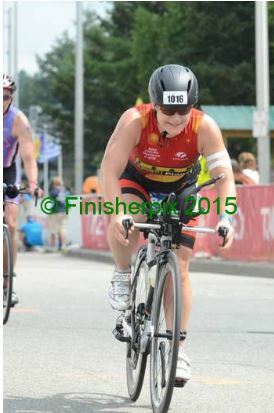 I still felt good, disappointed at my bike split but figuring I could rock the marathon. Lotion, more fluid and I was off. The Run, wow, it was hot. I was melting. My stomach was sloshy, sloshy, sloshy. My shoes felt tight and I remembered that I had put insoles in them because my heels had been bothering me. Too late now. My first mile pace was 9:30 and by the second I was slowing down, a lot. My blood sugar had crashed. I knew it would happen and was proactive so it wasn’t bad but it was enough to invoke disorientation. I tried eating everything, pretzels-yuck/pucky; gels-yuck! ; bonk breakers-no; Gatorade no. I felt like my stomach was so full. I had to settle on cola. And I seriously drank most of a 2 liter at that second aid station. I didn’t leave until my blood was up. They thought I was nuts. I heard one lady talking about getting medical and I told her this always happens. She seemed satisfied. Fuller than full, I left. The third aid station was run by the school cross country team, smile! I took water and cola. I jogged to the next and on my way had to pee. So I let it out. Wheww…at least I wasn’t super dehydrated, just a little (so I thought). My stomach was in a state of chaos so I walked the ups, slowly jogged the flats and downs. I saw Amy, looking like I felt, which was refreshing-kinda. She gave a cheer and wave. Then I began to see locals Caitlin, Karen, Mary, Alicia. Wow–people looked good and were happy. I was trying too. On my way back I saw Lonnie and a few other familiar people. Walking the ups, jogging the downs/flats was working. I knew I would finish and had settled on it not being close to what I wanted. Each station I took two waters and two colas. My sugars were stable. Move forward I kept saying, move forward. I felt awful. If you could have poked a hole in my stomach that may have helped. Back into town was fun, around the lake was fun. I thought about my sandals in my special needs bag but couldn’t imagine running 13 miles in sandals Although Bob Tysen and I did discuss it. My toes were in serious pain but my heels were great! I tried not to book the downhill knowing that it would trash my legs like no other. I could feel arm chafe. It was still really really hot. Heidi and Bob Underwood spotted me and were talking about skiing. I felt awful because I was incoherent at that point. She encouraged fluids, which I took. I asked Colleen if I could borrow her bike, she said that was the last leg. The Placid Planet people cheered me up the hill. To the next aid station-I grabbed some base salt. This stuff not only helped my crampy legs BUT somehow helped my stomach. Down to the kids, they were excited and in good spirits. Joe gave me bonk breakers that I couldn’t get open. After fighting the container, I got them. YUCK! No more sweetness!! Out was good. Back was rough, people were falling apart. 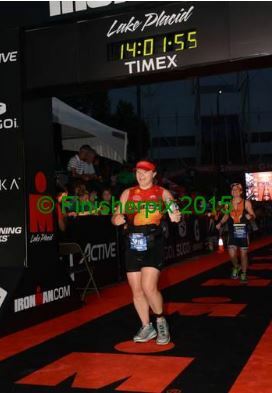 Pukes, blood, eww….At that point I felt like I was doing great compared to some others. Up the hill, back into town. Almost done!! The base guy gave me some pink excellence. I was thrilled to see Janice and was hoping she wasn’t mad at me. It was nice to see Dorine who had really motivated me to take the plunge. Great! I saw Mel on the hill up Lisa G’s. I started walking, not wanting my legs to cramp badly so close to the end. I ran small bits up and started again when I came around the corner by the pub. At that point I chuckled, I was going to finish. It wasn’t pretty but it would be done. My stomach was a mess and the smell of burgers almost made me yack. Out, back. Good. The only aid station I skipped was the last one. I seriously didn’t want to run over to it. I felt like I could make it to the end on what I had. Special needs, I again thought of my sandals. I bent down a bit but couldn’t reach my feet and figured it was more effort at that point than it would be worth. Next time. 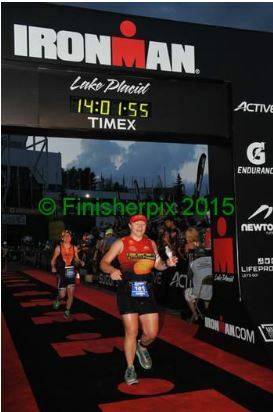 It felt great to finish and not lap. The oval was amazing. It seemed liked people were 20 deep around the whole thing. I started to cry when I saw Dori, Tom and Charlene. I wish I had stopped to hug them. Around the corner I was looking for my mom, I had only seen her briefly in T2. I didn’t see her. 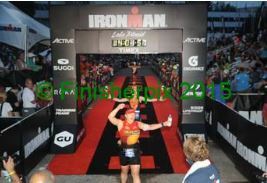 When I crossed the finish line it was great–lots of cheers “Amanda Zullo- You are an Ironman!!!”. My catcher was awesome. I got my medal, hat and shirt. No photos. Apparently I was quite out of it. She brought me all sorts of food. I just wanted to walk. My belly was super full and I couldn’t eat. I couldn’t walk well either, my two outer toes were black and blue with little feeling. I waddled into T2 to get my bags. Randy made me sit and eat 1 slice of pizza. Woah, not feeling good. They got me my bags. I tossed the fries, YUCK. I commiserated with Keith and Bill, two former IM athletes. I packed my bags and headed up the street to find Kevin L, T3, or my mom. 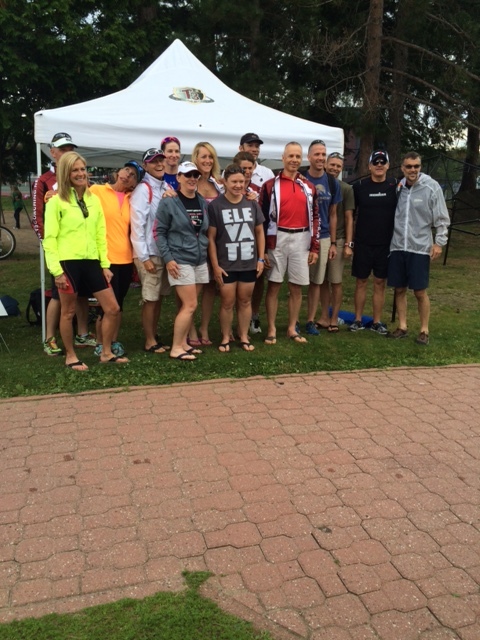 The T3 crew was pretty amazing. Coach Kevin got us all in super good shape and emphasized not being focused on times (now I know why!). They are Super supportive before, during and after the race. They made me sit. Let me walk to the lake. Got my special needs bags.Fed me a banana-which has never tasted so good. They kept covering me up but boy–I was hot!! Once my mom came to get me we searched for Kevin. When going to get Kevin I jumped into medical to make my mom happy. I was 22 pounds over what I was at check-in. My vitals were fine so the nice lady let me leave and warned me that I was going to need to pee a lot in the next day or two. The hike up the hill was rough. We went slow. Town was beautiful. Why do it? Its funny to be done with something that you paid attention for day after day for 13 months. It was like everything led up to it and was going to influence the result. One of my biggest lessons learned is that the result is the result. It is slightly determined by preparation but truly what happens on that day is the final call. You can’t fix or change it. It is what it is and you need to accept that. My expectations for myself were high, too high. I had wanted to finish, at the latest, at 12:30. Ideally I’d break 12 hours. On the last loop of the bike I came to realize my bike time was going to be at least 45 minutes slower than I wanted. I couldn’t figure out how. I’ve struggled to improve on long distance race results. My fastest marathon time took 7 years to beat and I only beat it by ~:02 seconds. 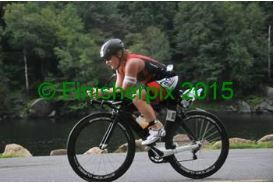 My fastest 70.3 is still my fastest. For this, I see many areas that would decrease my time significantly. After the race I had said I would never do another. Today I’ve checked and seen that registration for next year hadn’t closed. Hmmmmm. That day, many things went well for me. b) I nailed and reacted to my blood sugar perfectly. From training I knew it would spike on the bike, so I took some insulin. My perpet (6 scoops; 10 antifatigue, 6 electrolyte tabs) and four gels along with some rice stuff was great. Talking to diabetics I knew it would drop in the run so I drank gingerale in transition. When I couldn’t do solids, I took in cola. My range for the day was from 55 (on the run) to a high of 280 (on the bike), averaging 150. WOW! c) The swim. This went great for me. I got bumped but not too much. I swam and sighted. It was 5 minutes slower than I wanted but given how relaxed I was that didn’t matter. The not good was all stuff I did to myself. a) I had no hydration plan-so I ended up drinking way too much on the bike. I had to fill up at the first aid station. The guy in front of me in transition went in and weighed himself. At the time I thought, ugghh, what a waste of time. I now know. Maybe next time I’ll do that too. I will find a way to better monitor this for the future. After the event (2.5 hours) I weighed 22 pounds more than at weigh in. b) This is embarrassing. 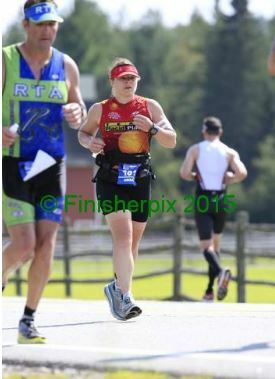 My calves and heels had been a world of hurt the two weeks before IMLP. Serious pain. Tim had fixed them on Tuesday, a bit. I was afraid that may be what kept me from finishing. I spoke with our local shoe expert who gave me great advice on which shoes to run in. Being my smart self, I decided to place super feet insoles into my Bondi 3’s. Needless to say by the end of the event I couldn’t feel my outer two toes on either foot and was hobbling like no other. I contribute this to my super slow marathon time. In part! c) Major chafe, like seriously bad. Legs, arms, belly, back. The first shower was a NIGHTMERE!! I was told more Vaseline–when I do this again you can bet I’ll have a ton of it!! I will also wear a shirt with an integrated bra. So-I finished in 2 hours longer than I had planned and significantly more screwed up. Its funny because it is something I’m totally embarrassed about. What I’ve realized is that people are just shocked they know someone who even did it at all. Will I do another, probably-I’ve got a bit of vengeance for the mistakes I made here. I guess that is how people get the triathlon bug.